Posted on May 28, 2012	by Platanos, Mangoes and Me! About a month ago when Lazaro and Natasha of 5 Star Foodie asked me to be part of their new Spring 5 Star Makeover “Restaurant Wars” I was ecstatic. This is my first event and it involves about 8 teams of three bloggers each. Each team choosing a secret ingredient and the name of their restaurant. 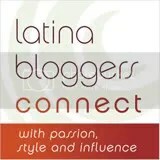 There is a lot of talent out there and you will be able to meet new bloggers and see what some old friends are up to. Our team, Team 3, consists of yours truly, Lori, our team leader, Taste with the Eyes and Debi, Table Talk, two exceptional and talented bloggers. 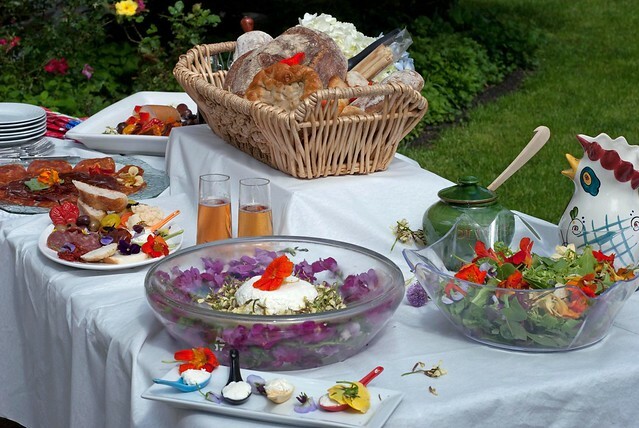 Our concept is a virtual al fresco restaurant, Ciao Fiore. 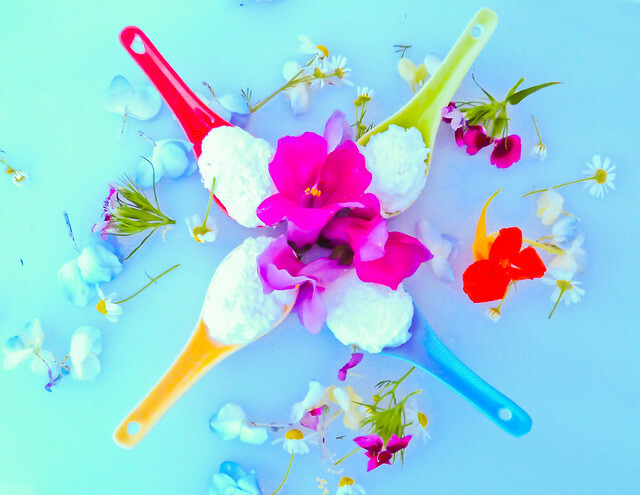 Our secret ingredient, edible flowers. The restaurant will be featuring three courses. I am in charge of the Antipasti Tavola (appetizer table), Lori, Primo (main course) and Debi, Dolce (desert). Our Antipasti table’s star is “ricotta fresca”, home-made cow’s milk ricotta with the addition of arugula flowers for an extra mild peppery taste. Creamy: the star ingredient of the “antipasti” table. Salty: Italian sausages and prosciutto. Crunchy: Assorted breads and focaccia. Acid: Giardiniera: Assorted picked vegetable and olives. 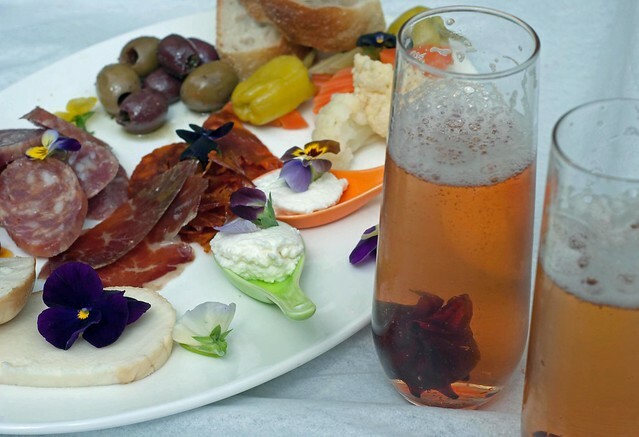 Let’s not forget a glass or two of our wild Hibiscus flower infused Prosecco. 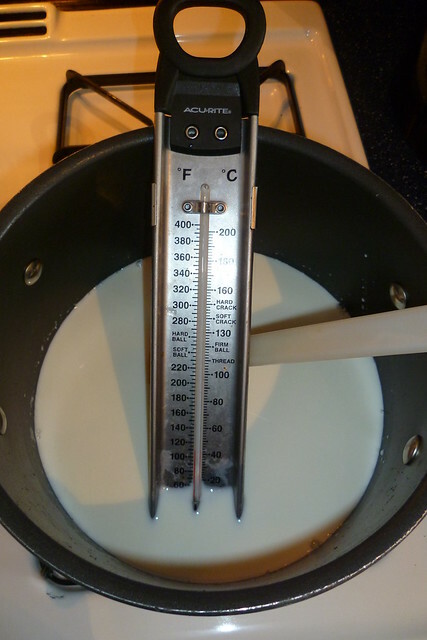 In a saucepan combine milk, cream, salt and bring mixture to a simmer over medium high heat stirring with a spatula until thermometer reaches 180 degrees. Once mixture has simmered, add the lemon juice stirring gently until blended. Let mixture sit for about a minute or so, turning down the heat. 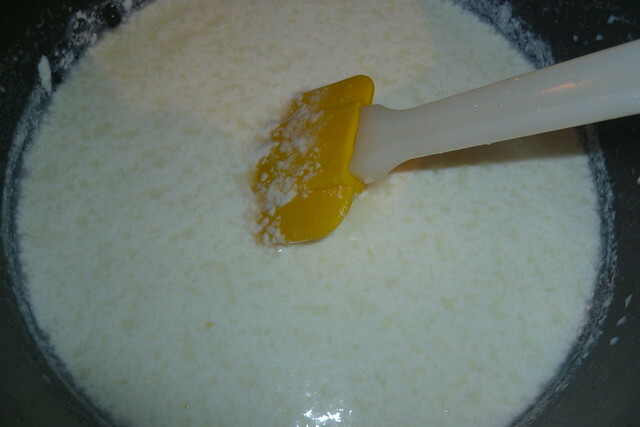 Once curdled, let set for a few minutes and then pour into your cheesecloth prepared colander. 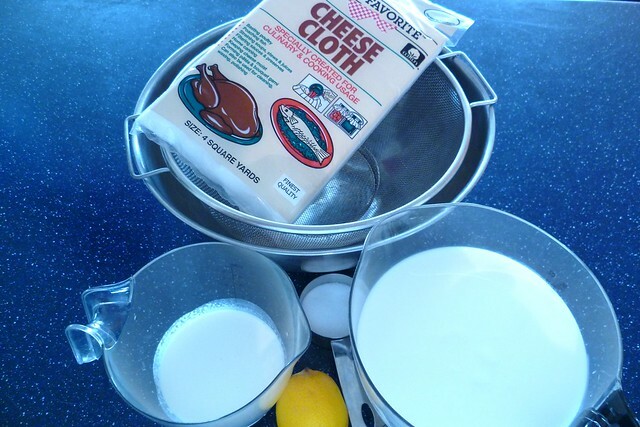 At this moment you can pick up the cheesecloth, twist and let drain for about and hour then place into a mold and refrigerate until ready to use. This is good for about 3-4 days. This entry was posted in Appetizers, Breakfast/Brunch, Italian, Italian Dishes and tagged Cheese. Bookmark the permalink. Of course we wish we were not enjoying all of these delectable treats virtually. I can’t wait to see what Ciao Fiore has to offer. Its looks amazing!!! i dont know how the taste is, but the presentation is outstanding!!! Wow! This is gorgeous! I’d happily belly-up to that antipasti tavola. You did a great job following your team’s theme for the challenge and more than earned your membership in the club. Please take my reservation for a table for 1 the grand opening of Ciao Fiore – I can’t wait to see what Lori and Debi did though I’m perfectly satiated with the antipasti. Beautiful, Norma; and even at 8:40am I am ready to dig into the Ricotta Fresca! I need a seat at that restaurant! Absolutely gorgeous presentation and the fresh ricotta seems fairly simple to make (bonus!). Fantastic job, Norma. 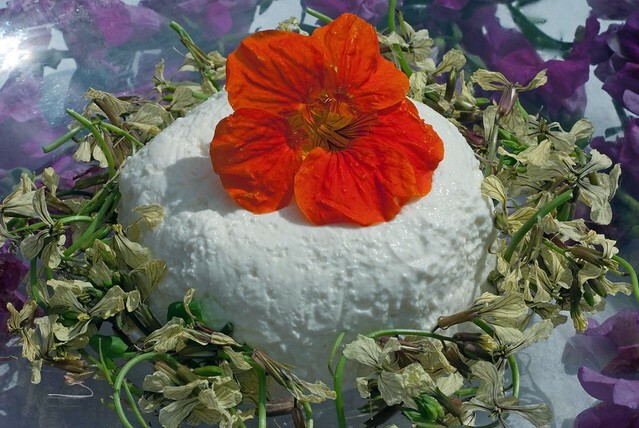 Thank you for the ricotta article, my Sicilian grandmother would make ricotta by touch… If she was to dry it for grating she’d sometimes incorporate some goat milk, once she experimented by adding grated pecorino. If making hard cheese more times than not she’d incorporate peppercorns. All serious cooks should try home-made ricotta, they’ll never go back to the grainy commercial product. Great photos, thank you. This is fantastic, Norma!! I’ve made fresh ricotta as well and it’s so delicious. Your tablescape is great, love all the other antipasti that you selected. Bravo! oh wow, what a fabulous tablescape 🙂 i’ve been meaning to make cheese, and the pairing here is certainly one to savor! Great job with the challenge! What a great antipasto setting and making your own cheese, too cool. You did a fabulous job. I think your idea of edible flowers is brilliant. The homemade ricotta fresca must be incredible and what a gorgeous presentation! The homemade ricotta must have tasted so much better! Wow – this was very ambitious! Love how you shot it outside – like a magazine spread. I love fresh ricottoa, and it’s so pretty with the flowers. Great job! That cheese looks creamy and delicious!Beautiful pictures,Norma! It looks absolutely gorgeous – pretty, elegant and delicious. Counting down…. I really would love to try this…just beautiful and a delightful addition to the menu! Beautiful table full of delicious looking food. 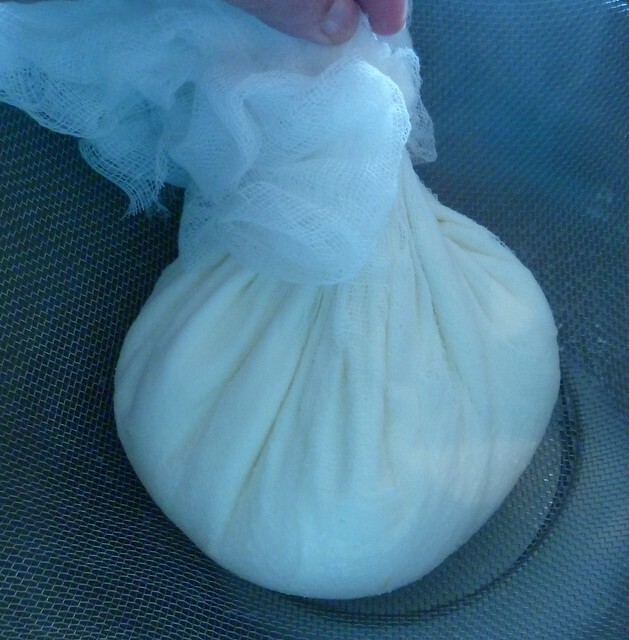 I just found a source for fresh milk without pasteurization and would love to try fresh ricotta. Fabulous¨I really have to try making my own ricotta.